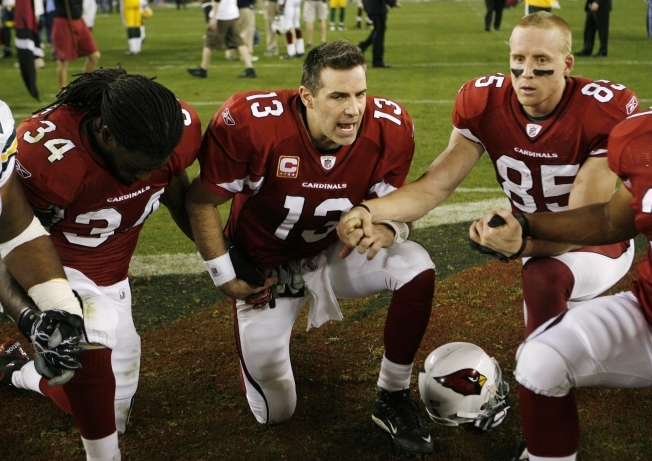 Kurt Warner #13 of the Arizona Cardinals leads a prayer after his team won the 2010 NFC wild-card playoff game 51-45 against the Green Bay Packers in overtime at University of Phoenix Stadium on Sunday. If the over/under is for Saturday’s Cardinals-Saints game is under 90 points, take it. When Arizona and Green Bay can combine for 96 points, think how many Arizona and New Orleans can put up. Having said that, I’m painfully aware that the likelihood is now great that Kurt Warner and Drew Brees will conspire for a 9-7 final in the divisional playoff game. Isn’t that the way it goes? When we expect offensive explosions, we get mistakes and defense and low scores. When we expect defensive struggles, we get hit by blowouts. And when we expect Green Bay to blow Arizona out of the water, we get one of the greatest displays of passing we’ve seen since, well, since the last time Kurt Warner got hot in the playoffs. This wasn’t supposed to happen, experts said. The Cardinals weren’t that good, being in the playoffs only by virtue of winning the NFC West, which would be like a real football division if it had any real football teams in it. You’d think realize that if you give Warner time to throw and let his receivers run their routes, there is no stopping Arizona. The man got the Cardinals, the NFL’s answer to the Los Angeles Clippers, to the Super Bowl. He’s won a Vince Lombardi Trophy. He’s a former MVP. He is simply superb. The Packers certainly know now. They're going to have to live all winter and next summer with the knowledge that they simply weren’t ready, which is a little amazing given the team just played each other in Week 17. Now it’s on to New Orleans, and you can bet that the Saints were sitting at attention and taking notes as they watched Warner complete 88 percent of his passes (29 of 33) for five touchdowns and no interceptions. You also know the Saints won't dismiss the Cardinals are pretenders. New Orleans, after all, is even more bereft of historic success than Arizona. The Saints should know better than to take any team lightly. That is especially true of the Cardinals. When they are right, there is only one team that can even be compared to them. By happy coincidence, that team is the Saints. Unless one or both of these teams plays defense, there’s no telling how many points they’ll put up. Brees and Warner are rhythm quarterbacks who like to release the ball as their receivers are making their breaks. When they’re in synch, you can’t stop them. The receiver turns around, the ball hits him in the hands, and all a defender can do is make the tackle. Warner was like that against Green Bay. The Cards punted just once. The rest of the time, they rode Warner’s arm up and down the field, laughing at the Packers’ feeble attempts at defense. Games like that give the impression that Arizona's unstoppable. That's the feeling that surrounded Brees and the Saints most of the season. I remember thinking during their Nov. 30 whipping of the Patriots that I might be watching the best football team I’d ever seen. The Patriots didn’t even belong on the same field. What’s more, they knew it. And then New Orleans finished the season with three losses, including one to the Cowboys, and we changed our minds. New Orleans could not only be beaten, it could be badly beaten. Brees could be made to look like Brady Quinn. The mighty offense could sputter and choke and die. Again, that all applies to Warner and the Cardinals. When you disrupt a rhythm quarterback’s timing, bad things happen. It was true when the Patriots stunned the Rams a decade ago, and it remains true. A week ago, nobody thought the Cardinals would beat the Packers. Now, a few probably think they can beat the Saints, but not many. And if they win again, no one will think they can beat either the Vikings or Cowboys. They might want to think again. The Cardinals may not be the NFC favorites, but right now they are the most intriguing team remaining. After Sunday, you may not think much of their defense, but you also know there’s no way you can afford to ever sell them short again, not as long as Kurt Warner is running the show.